Lillie McFerrin Writes – House of Five Sentence Fiction. And how does it work – you need to write a fiction story in FIVE sentences. – short and sweet. Let’s go for it. Three days in a row Ella hadn’t left her bed, she didn’t feel like doing anything, not after what Connor did to her… how could he call off their wedding just a week before the D-Day! If not for Mr. Pibbs she would have starved herself to death in the last three days, with the single thought in her mind. She got up and stood near her huge window… ‘what a bright fresh day’ she thought picking up Mr. Pibbs in her arms… a day to re-start perhaps, no more wasting tears for that jerk, she was now sure of it, ‘thank you my love’ she said planting a kiss on the thick fur of Mr. Pibbs. Linking this post to FSF @ Lillie McFerrin and Ultra Blog Challenge Day 1. 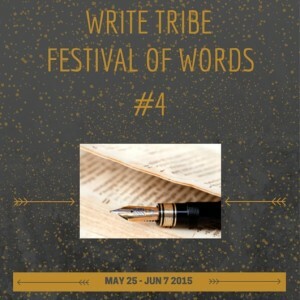 I am participating in Write Tribe festival of words #4 Post written for DAY 4 Topic: Being Human – writing an inspirational post. Small yet poignant story. Loved it Tina. Glad she had at least Mr. Pibbs. Mr. Pibbs is a fuzzy lil cat, girls best friend! It's wise to leave the excess baggage behind and take a fresh start. Yes you've done the right thing. Great job! A short little story, but you packed a lot of emotion in there. They are true friends,aren't they? True moving ahead in life is important. Thanks for dropping by. Thank you Barbara. Thanks for dropping by. Good story that could be a true story. Love that Mr. Pibbs saved her. Our fur friends and family often do that. A very refreshing tale :-). Chuckle. You cheated and used a comma to link two sentences. But, your words did the job of sharing a story in almost five sentences. I have a cat myself, so I understand! Nice story, with a happy ending – appropriate for the sunny side of life! These are wonderful 5 sentences. I will give it a try too. All the best for the month of fiction. Loved the narrative, whoever may the pet be.